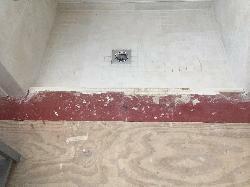 I have seen this used were tiling on a mix of floor substrates. We have a former that has been tiled. The former meets a steel beam. We just want to tile over the steel beam and then install vinyl flooring for the rest of the room. Is it possible to tile floor tiles onto a steel? If so how should this be done and what sort of adhesive should be used? Also - from a different thread - Should we apply silicone to the former?